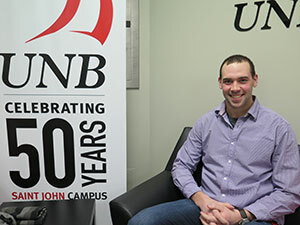 From the classroom, to the football field, to the student centre, UNB Saint John student Jordan Tracey excels across campus and is thankful for the undergraduate scholarships that helped make his university career possible. A fifth-year student and soon-to-be graduate from the bachelor of science program, Tracey balances his studies with various extracurricular and volunteer activities on campus. In addition to working with a biology research group for the department of science, Tracey plays for the Seawolves football team, is VP external for the Student Representatives’ Council (SRC) and volunteers as a tutor and mentor for the Promise Partnership. “I might not have had the time and money to attend university for my fifth year and stay involved on campus without the scholarships I received from UNBSJ,” says Tracey. In celebration of UNB Saint John's 50th anniversary, a 50th Anniversary Scholarship Fund has been established to encourage and motivate students. With a goal of $100,000, the fund will support the success of our future leaders like Jordan.